This classic – the carrot cake – is simple to make, full of sweetness, spices and walnuts, and covered with a glorious cream cheese icing. I’ve been making it since I was about twenty (a very long time) so why it took me seven goes to get it cooked and photographed and onto this blog is beyond me! If you want to read this sad and sorry tale of food blogging then head to the bottom of this post. Otherwise, forge ahead, make this toothsome concoction for your family, friends or workmates, and enjoy their smiles of satisfaction. Preheat oven to 180 C. Grease a 20 cm round cake tin and line the base with silicon paper. In a large mixing bowl combine the brown sugar, grated rind of the lemon, flour, cinnamon, nutmeg, salt, grated carrot and walnuts. In a small bowl whisk together the eggs, oil and mashed banana and then combine with the dry ingredients and mix well with a wooden spoon. Spoon into the cake tin and smooth the top. Bake for 35 – 40 minutes, or until the top springs back when lightly pressed and a skewer, gently inserted into the middle of the cake and removed, comes out clean. Turn out of the cake tin and cool on a wire rack. When completely cold, ice with the cream cheese icing. Keeps for 3 days in an airtight container. To make the icing beat together the cream cheese, the juice of the lemon and the icing sugar, until thick and glossy. 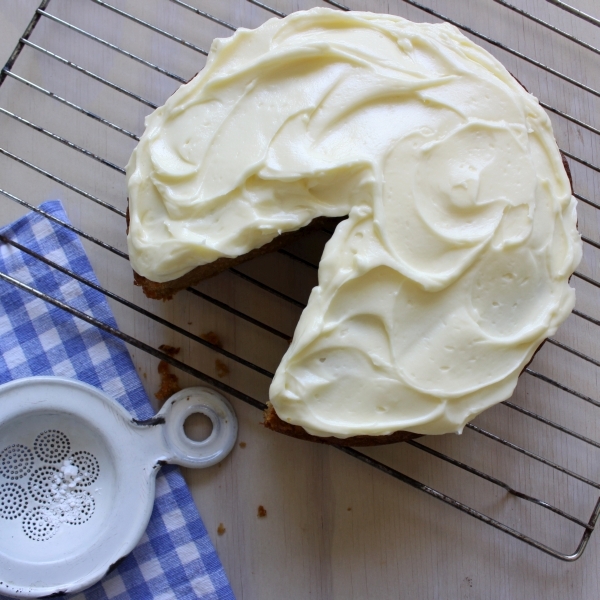 First attempt: Recipe testing – looks good, tastes good, family eats cake. Second attempt: Bake cake, ice cake, get ready to photograph cake, it rains, family eats cake. Third attempt: Bake cake, realise plain instead of self raising flour used, cake is actually pudding, family try to eat cake but can’t, dog eats cake. Fourth attempt: Bake cakes in muffin tin in hope of good result, forget they were in the oven, burn cakes, throw cakes away. Fifth attempt: Bake cake, cake sticks to bottom of tin, cake collapses, cook despairs, family eats cake. Sixth attempt: Bake cake, ice cake, take photos, bad photos, cook rages, family eats cake. Seventh time’s a charm: Bake cake, ice cake, take photos, photos OK, cook writes blog post, family eats cake, family vows not to eat carrot cake again. Thanks laura..it’s been a while since I made carrot cake after that episode, but maybe sometime soon I will feel up to it again. 🙂 Thanks for spending so much time cruising around my blog. Cheers, margaret. Your list of seven attempts to put this cake on the blog had me laughing out loud, in a cafe. Pure gold. 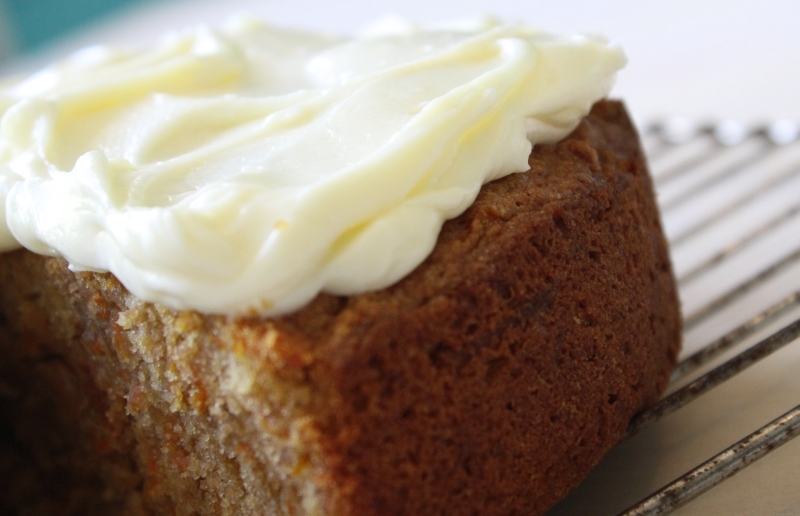 Has your dog also vowed not to eat carrot cake ever again? The cake sounds and looks great, so your dedication was rewarded finally! Been there! Glad you stuck with it. I love the addition of banana. Oh do I feel your pain! But I’m impressed you stuck with it — after attempt #4 I might have given up. Of course, that cake is so pretty and looks so delicious I’m guessing it was well worth the effort!